So for a while now I’ve been dabbling with streaming purely from a technical / production standpoint. I’ve been looking at a few different challenges including having a workable Sound FX board option. Now to make a sound board “Streamable” you could simply run one on your local machine which OBS Studio (https://obsproject.com/) will easily pick up. 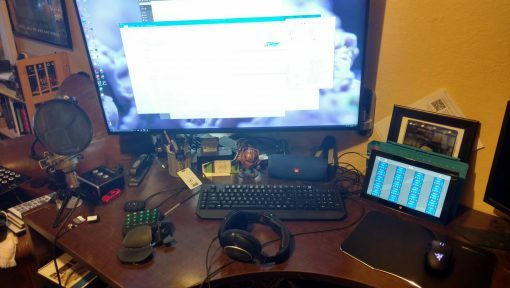 I personally wanted to re-purpose my aging Surface RT tablet to have an external touch enabled sound board instead of an app running on my main machine. Software wise there are likely tons of options, the first search in the windows store that worked with windows 8.x->10 include ARM (RT) was Media Soundboard (https://www.microsoft.com/en-us/store/p/media-soundboard/9wzdncrdl7g2) for $3. I felt a small investment was worth it. You could duplicate this effort with any phone/tablet/computer that has an aux out. 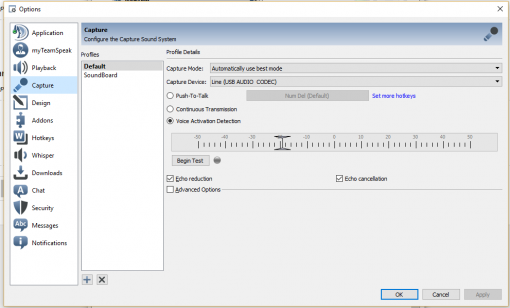 Adding an audio input in OBS and selecting the aux input for the soundcard was simple and doesn’t need explanation here, the downside to just using OBS to do so means you must set windows to always play that input back to you. I however would prefer to have the audio play through teamspeak (which regular desktop audio doesn’t do, thankfully). While I do stream most of the time I just play with my friends on teamspeak, and this soundboard was mostly to annoy, er, engage with them. This is a little more tricky, so lets get started! Disabling the TeamSpeak corrections let you make sure you’re in control of the volume and helps avoid distortion. Disabling all these things lets you be in control of the input volume (through the host computer and through the tablet) and makes sure you don’t have any distortion (Echo reduction/cancellation was really being weird with mine). Now hit OK and we’ve got a profile set up to use! Time to get that soundboard account connected and set it’s profiles. Connect to your TS Server as you normally would, then open the bookmarks menu and right click on your “Soundboard” account and hit “Connect in new tab”. You’ll now have two tabs open to the same server! You’ll notice that one tab will have input disabled since they are both using the same input profile, lets fix that. Choose your soundboard tab and go to the “Self” menu -> Capture Profile -> Select “Soundboard”. Then Go ahead and do the same for playback but select the “default” profile that is already selected, this will de-select it so sounds don’t go anywhere from that tab. Time to test! Make sure you’re in the same channel and you should see two accounts, trigger your soundboard and hopefully you (and everyone you’re in teamspeak with) will hear your sounds. 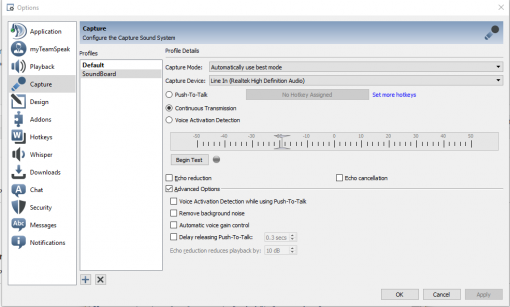 If you’ve set it up properly you should NOT have the aux input “Playing back” through your speakers/headset in windows as Teamspeak will “Play” that second account through your first account. If everything is working as expected, go back to manage bookmarks, expand the “Advanced Options” and set the “Capture Profile” and “Playback Profile” on your soundboard account so they start where they need to be when you connect.